This is one of those posts that has been sitting in the queue for quite a while stamped as "draft". I've waited so long to finish it up that I don't even know if anyone has Saskatoons left that they can forage! I think it is this terrible weather getting to me. Right now - and for the past several weeks - our air is filled with wildfire smoke and it is making me feel pretty gross. I noticed that everyone today seemed a bit on edge - I think as a province we're all tired of it, and a bit stressed out about the whole situation. 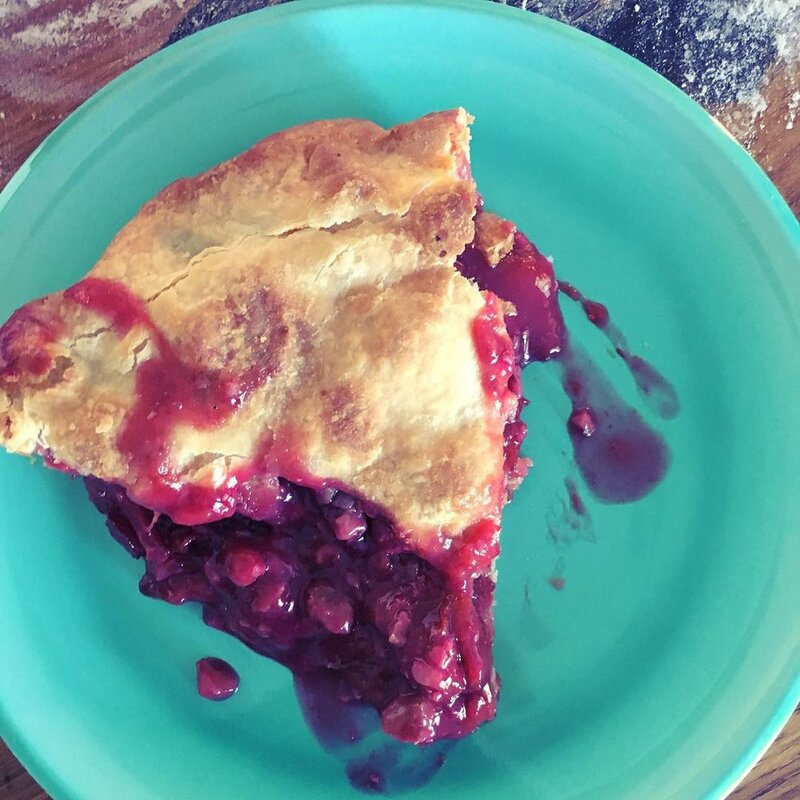 Anyway, maybe you have some Saskatoons hanging out in your freezer - or you can buy some frozen from the berry farms that grow them - and then you can still make this pie (it's definitely worth it if you do). When we moved to Kamloops I was a little bit disappointed to lose access to all the beautiful, free blackberries that seem to line every roadside on the coast. What I would soon learn is that this semi-arid landscape makes up for it by the Saskatoon bushes that are all over the place. It takes quite a while to pick enough of them to make a decent harvest, but it's a bit more relaxing than collecting blackberries. I have to say that if I had to choose which free berry I wanted near my house I'd go for blackberries for taste, but with Saskatoons there are no thorns, and we were bothered by fewer wasps and spiders than I usually am in the blackberry bushes. Mr. Forager is also happy since he has fond memories of eating Saskatoon berry pie and jam during his childhood on the prairies. Use any pie crust recipe you like for this one. I'll share one that I like at the end of this post if you are looking for a good recipe, or just want to try something new. This one is one of my go-to recipes and it has really good results. Whatever you do, make sure your kitchen is as cold and dry as you can get it (for example, I wouldn't recommend doing this in the middle of a major steamy canning session, or anything else where you are boiling something on the stove for a while). I usually have decent results with most pastry crusts in my kitchen (I live in an almost desert, and the air conditioning is always blasting) but then when I made the same recipe as I usually do at my mom's more humid, coastal, warm apartment, I had all kinds of challenges rolling it out nicely. It still tasted fine in the end though so don't worry if you have some challenges! Takes approx 1 hour 30 minutes , yields 1 pie. Whisk sugar and flour together in the bottom of a saucepan until fully incorporated. Ideally this way you will avoid clumps. Add Saskatoon berries and cook over medium heat until berries have broken down, released their juices, and the liquid is thickening. Add lemon juice and zest, and cook for a few minutes. Take off heat and pour into a bowl to allow it to cool off somewhat. Stir in cherries at this point rather than cooking them in with the saskatoons so they maintain a bit of their own texture and shape in the finished pie. As the filling cools (you want your pie crust to be as cold as possible before putting it in the oven) make your favourite pie crust recipe for a two crust pie. Roll it out, fill, crimp, and cut vents in the top of your crust to allow steam to escape while cooking. This is a pretty juicy pie, so some filling will probably spill out the vents while cooking but that's ok! After 15 minutes, turn the oven temperature down to 350 degrees, and cook until filling is bubbly and the crust is nicely browned. Probably about another 45 minutes. Cut butter into chunks, and drop into flour. Using your fingertips (my preferred method), a pastry blender, or two knives, work the butter into the flour until it resembles fresh bread crumbs. Tablespoon by tablespoon add the water to your butter/flour mixture. Stir to incorporate a bit between each tablespoon so you can see how you are doing. You might need more or less water than the recipe states depending on how dry the air is, or your flour is. I usually need more. When the dough is looking moist and shaggy, mold it into two balls. Roll and make your pie, or wrap well and store. Keeps in the fridge for three days, or a few months in the freezer. The Peanut Butter Cream Cheese pie was seriously incredible. Just pour the filling into a crumb crust and chill it. So easy, and so delicious. There wasn't very much sugar, and it was full of protein and healthy fats from all the peanut butter, cream cheese, and butter that it was almost a protein bar in pie form! I really loved the Eggnog Chiffon Pie. Really loved it. I was starting to think that I didn't like chiffon pies in general since they have all been a little weird in my opinion so far, but this one was perfect. Cream of Wheat Custard pie made for the perfect thing to bring to our Life Group's annual New Years Day (or day after as sometimes happens with scheduling) Brunch. It was light, but filling at the same time. Not too sweet, and the whole wheat crust was better than I expected! I wasn't sure how I was going to feel about whole wheat pastry, but now I am excited to try with some different pies too! The Maple Pecan pie I froze and saved for Christmas was excellent as well. I was really happy with how it stood up to the freezer. When we ate it after Christmas dinner you couldn't tell at all that it had been baked a couple weeks beforehand! I lost some speed working through this list over Christmas, but I am excited to get back into the swing of things. There are lots of beautiful citrus based pies that I am excited to try out in the coming month or two now it is in season! It has been quite some time since I have shared any of my pie adventures with you loyal readers (I'd love to hear from some of you in the comments to prove that I'm not imagining you) but rest assured I have still been on my baking journey. At this point I believe I have almost completed most of the pies that require fresh seasonal produce. There are only a few left that I will have to decide whether or not I will make them with what I happen to find in the grocery store or wait until next season. Since my last update the pies have been either incredible, or at least quite tasty. Nothing I tried recenlty has been a complete dud so I am happy about that. I am also incredibly thankful to my Life Group at Dallas Barnhartvale Church for helping me eat them all! Sometimes 'doing life together' looks like deep, meaningful conversations, and sometimes it looks like eating a whole lot of pie! Thanks for being my guinea pigs!